ERNIE BALL IS GIVING YOUR BAND THE CHANCE TO PLAY UPROAR! The battle is on, as the Ernie Ball Battle Of The Bands returns to the Rockstar Energy UPROAR Festival for a fourth consecutive year in 2014. The annual competition is underway now for most dates on the touring rock music and lifestyle festival, and runs throughSeptember 12 (deadlines vary by market). Bands can enter the Ernie Ball Battle Of The Bands—and fans can vote for their favorite band—at http://uproar.battleofthebands.com. Bands will be chosen one week prior to the venue they’ve selected to play. 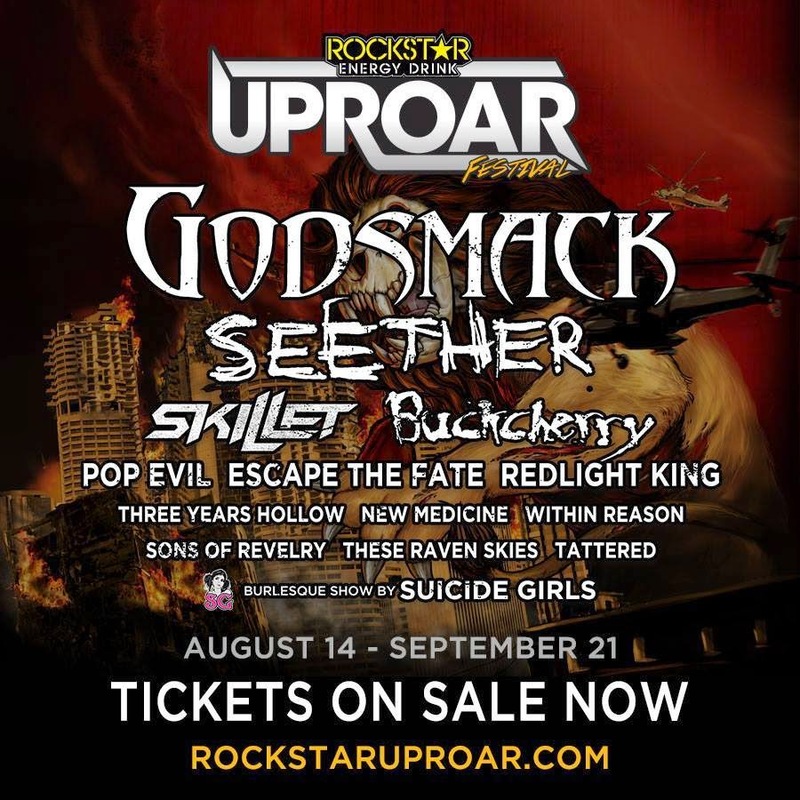 Unsigned bands can enter to win a chance to play live on the Festival Stage at the Rockstar Energy UPROAR Festival in their market this August and September. Finalists will compete for the grand prize--valued at over $15,000--which includes a coveted spot on the 2015Rockstar Energy UPROAR Festival, the opportunity to record an EP with legendary producer/mixer Jay Baumgardner at NRG Recording Studios in Hollywood, CA, a Rockford Fosgate Prize Pack, Ernie Ball Guitar String Endorsement, Music Man Instruments, and more (see below for full prize listing). The judges for the Rockstar Energy UPROAR Festival 2014 Ernie Ball Battle Of The Bands will include Keith Nelson of Buckcherryand legendary producer/mixer Jay Baumgardner. The fifth annual Rockstar Energy UPROAR Festival hits the road August 15 and runs through September 21. The festival’s powerful lineup includes multiplatinum mainstage bands Godsmack and Seether, along with Skillet, Buckcherry, Pop Evil, Escape The Fate, 3Years Hollow, Within Reason, New Medicine, Sons of Revelry (2013 UPROAR/Ernie Ball Battle Of The Bands winner), These Raven Skies, and Tattered. 2013 Ernie Ball Battle Of The Bands winner Sons Of Revelry will be on the road with the Rockstar Energy UPROAR Festivalthroughout the five-week trek. The Brantford, Ontario quartet—Scottish expat Toby Black (lead vocals/lead guitar), Corey Brouwer(backing vocals/rhythm guitar), Arron Rayner (bass), and Sean Boyle (drums)—have the kind of cohesiveness, camaraderie and chops that other bands would kill for. The band recently recorded a pair of EPs in the span of a month – one with world renowned producer Jay Baumgardner (Sevendust, Papa Roach, Three Days Grace, Godsmack) and the other with Canadian producer Brian Moncarz (Silverstein, Bleeker Ridge, The Reason) – and will release them as a double EP just in time for the 2014 Rockstar Energy UPROAR Festival. Visitwww.sonsofrevelry.com for more information. "Ernie Ball is excited to give Sons Of Revelry the opportunity to reach their dreams,” says Brian Ball, Vice President of Ernie Ball. "As we've seen with previous winners Mindset Evolution and the Chuck Shaffer Picture Show, the Ernie Ball UPROAR Battle Of The Bands is a tremendous way for bands to record with a legendary producer and tour with rock's biggest bands." · TC Electronic Pedal Pack. The current Rockstar Energy UPROAR Festival tour itinerary is as follows. Please note that the band lineup varies by date. Visithttp://www.RockstarUPROAR.com/tour-dates for details.